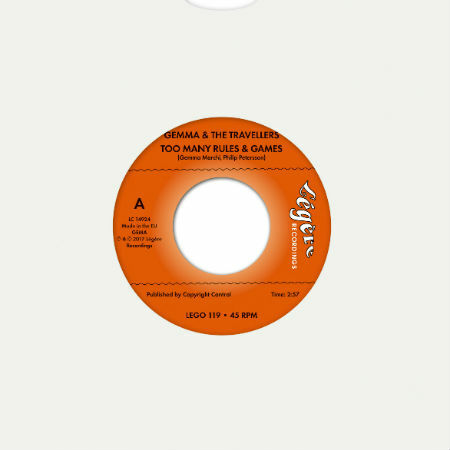 In anticipation of their debut full-length “Too Many Rules & Games” dropping on Légère Recordings on April 28th, France-based 60s soul and r&b band Gemma & the Travellers are launching a double-sider 45 with the titletrack of the album, accompanied by a brand new video. Single “Too Many Rules & Games” is a song about a woman who has had enough of a world run by men looking only for their own personal glory and fame. In the video the group are seen performing in sharp retro-looking suits, with Gemma in a vintage dress, against an urban backdrop sprawling with graffiti. The stark contrast creates a dynamic viewing experience that underpins the cutting lyrics. The 45 is backed by a cover version of the Aretha Franklin’s classic “Save Me”, reinterpreted in the band’s staple style. If this first output is anything to go by, Gemma & The Travellers are definitely a name worth keeping an eye on!